Scenes for winter and Christmas. This happy penguin can point the way to the Christmas cookies, Santa's workshop or anyplace you need him to lead the way. You can add snowflakes around him and long swirly tassels on his scarf. This penguin and signpost is a real favorite with the customers. It's silly, lighthearted and adds to the holiday cheer. 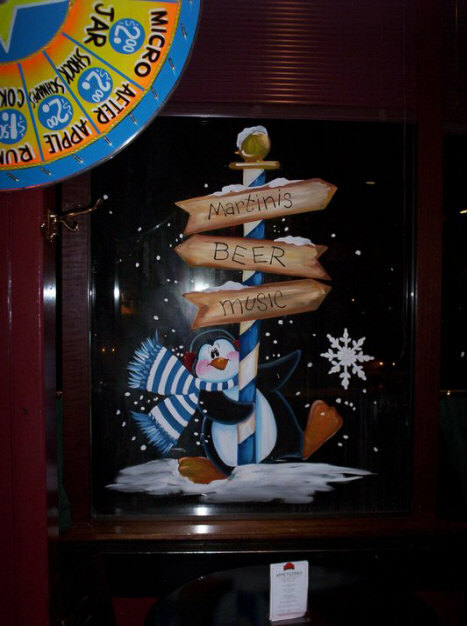 In this photo I painted the little guy on the inside of the window in a local pub of a downtown hotel. With the winter months these windows are most often viewed after dark from the patrons inside so that's where I painted them. Makes it easy to add shading and details from the side that will get the most views. I made every effort to start painting just as the sun was going down and before too many customers made their way to the bar. 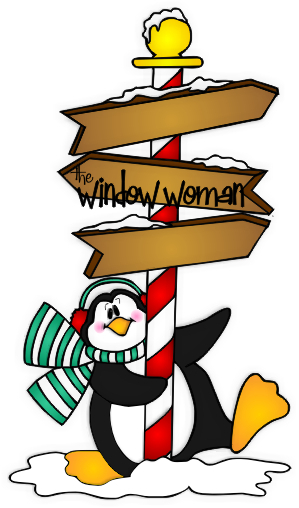 Because it was a dark penguin on a dark window I added white shading to the outside lines of the penguin so it would add definition.